Do consider that even back in the 90s games were at least $800. Even stuff like Type X2 games were several thousands. From the same interview, there is a possible price that the games would range from $1000 to $1500. Prices of EXA Arcadia games vary mostly depending on game size, complexity, and game budget to make back costs. Let all of us look forward to additional news in the future, whether it be more trade shows, interviews, and even release dates for the hardware worldwide, starting with Japan "before summer" of this year. Also looking forward to other conference appearances of Exa Arcadia for other regions as well. I guess GDC is out of the question because they're focused on launching the first batch of games within Q2 period (after Japan's release of course). The only reason I brought GDC up is that there is a lot of untapped opportunities for video games to be played multiple ways, especially cocktail displays that favor top-down and head-to-head games. Yeah, I really can't understand when you have to buy most of the games that are already on digital storefronts way less than what you're paying for the Exa platform, but I can understand the point. 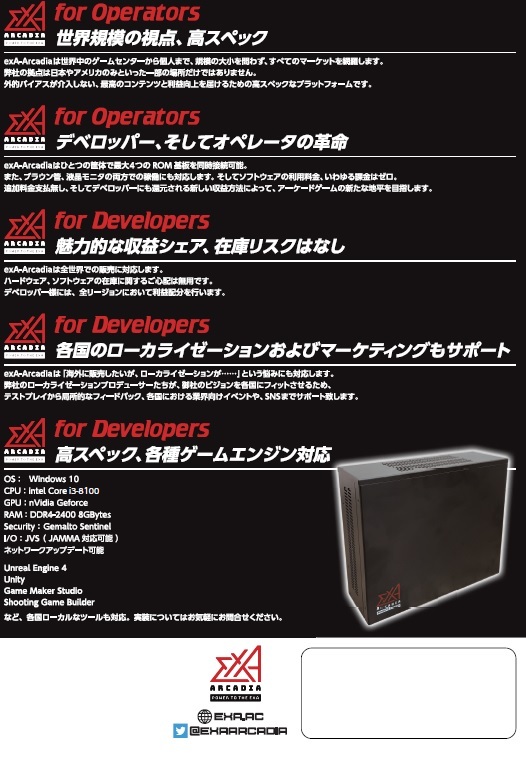 Be reminded that Exa versions that Shou mentioned will contain Exa specific content that are exclusive for the Exa platform, and will not be added into previous versions of existing games that are out on other platforms and even PC. (Such as, for example, Strania Ex's alternative soundtrack and some balance changes I assume. ), unless that justifies the costs though. I get that they have some r&d in it, and that you can't sell anything physical for $2.99 but the fact that something was hundreds of dollars in the 90's is not a valid reason why a steam port should cost 800 bucks in 2019. Having said that, there are some interesting games there already and i'm curious what will be offered (and for how much). I do like the idea of something that "just works". Not to state the obvious, but this is a commercial system for operators to put on location and earn, not something aimed at home collectors. The math is different in that case. I've got functioning eyes, I see the issues everyone else is pointing out too, some of these titles feel low rent. I'm sure they're taking anything they can get to build the catalog, it's a chicken and egg problem to launch a new system. If they can just get some units out there and even a few of these games are 'sticky' then they have a platform to build on and interest will rise. It takes time for original titles to be built, and you need a userbase to sell them to. But if I'm an op and I pay $1000 for a $20 Steam game it's because I'm guessing I can get more than 1000 $1 coin drop plays on it. Plenty of these games are ones I'd pass up on Steam, I've got a wishlist a mile long like most people, but I'd definitely be curious enough to try if I was lucky enough to have an arcade full of Exa machines available. In short, the Exa Arcadia is primarily aiming for operators who own small to middle sized establishments. Those types of customers expect a decent return of investment within a few weeks to some months from player engagement plus some in-game advertisement. The motherboard and games should be affordable enough so any arcades or shops can own a machine. I also want to show a video from Arcade Heroes, whom the host actually delves deep to everything and showcases his passion for Exa Arcadia machines as potential for expanding arcade markets. Your post from the other forum isnt entirely correct since it has been stated in interviews before the kit would be available for operators and home users alike, and that there even would be limited collectors editions for the collectards. Other than that i still fail to see why a $2.99 game should suddenly be 800+ usd for the added use of a coinmech (and some exclusive content). Imho who buys it is irrelevant as long as sales > investment and that shouldnt be too much for a game thats already published and running on pc. It's not like the kits are free to produce. The way arcade economy works is directly in line with how this is being done; being available to home users is more of a bonus than anything. The concept of arcade sales is like this: game is made, and estimated revenue for operators is calculated (generally via location testing, etc.). Based on that and development overhead, a final price is made. It doesn't make any sense to sell a game for $5 when an operator will make that back in literally 2 plays. Operators generally expect their investment to be paid back in the scale of a couple months, after which they become (nearly) pure profit for operators. If exA was a revenue share system (like NESiCA, ALL.NET, etc. ), then a cheaper sale price would make sense as the revenue stream continues beyond sale. Since it is not, and the only revenue is from direct sales, a higher price must be chosen. Of course, the revenue from these sales can (and likely will) be recycled into developing more games in the future, as there will be working capital instead of self-investment as most of the current titles are. This means more games of higher quality, more often. A win-win, don't you think? Plus he shows sales data on how easy it is for operators to break even from the EXA Arcadia machines within a short timeframe like a month. Of course that result came from Mikado as primary location test. This is for the operator market and not consumers, period. If you want to buy it, there is no limitation as an individual to buy it but don’t expect it to be consumer level pricing. No game on the platform is 100% complete, all footage is early. For context, here are recent prices for arcade games. On average, every game we put on test makes over 35,000 a week meaning an operator can recoup their investment in a month. That simply doesn’t happen with another platform or game. Let’s agree to disagree and leave it at that i don’t want to come across too negative because as i said i do like the idea of a new platform with new games if they are good, and ofcourse i would like them to succeed. Apart from that i’m sure they do have more insight in the japanese arcade market than any of us keyboard warriors. All games support 1080p native as a requirement so yes. A&B in particular will push the hardware. Collector’s Editions are planned for certain titles, we showed the Strania motherboard version at JAEPO. 1080p is pretty much the standard resolution for video games of today, and expected that would be the maximum resolution for Exa Arcadia games. I'd also like to point out that while the game selection looks "jank", there's not really much you can do about it, and you might wanna look at huge chunks of arcade releases instead of just cherrypicking the "nice" ones. There was some serious jank coming out in any given period, some of it far less playable than what we've seen out of exA so far. Thing is, a lot of the people that would be making arcade games are making them on consoles and PCs instead. Things like Hydorah and Infinos are pretty solid examples of this. Because many of these are indie devs and not arcade-oriented companies worried about deadlines, profit margins, and hardware R&D costs, they have a much easier time of making games that might actually be good. Again, Hydorah and Infinos are the products of two strings of various game versions and projects. That kind of thing just wasn't happening in the arcades like that, not unless it was a rhythm game that gets updated every other year, or certain (only certain!) fighting games that get an update or two. Nowadays, pretty much any game has room to grow like this. The great arcade games tend to be made by people who were given such freedom to do what they want. We know this because they often say that exact thing in an interview. Ray Force was basically hands off. Many early Namco games were basically hands off. Again, nowadays basically every developer has that opportunity. Post your tweets to your arcade vendors to show support for Exa Arcadia with release date Summer 2019! I doubt it's illegal, given how many fairly legit-seeming places doing exactly that are springing up in my town. Yes, the local distributors don't want competition. 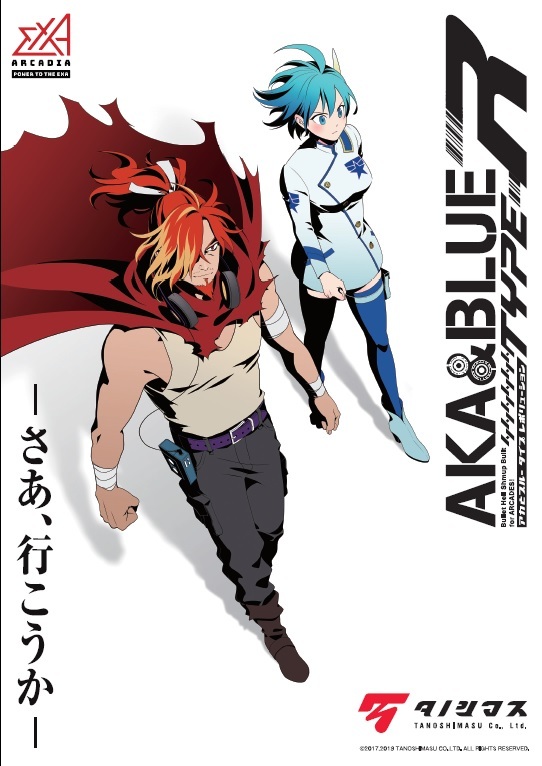 Exa Arcadia has finally uploaded the streams of JAEPO 2019 on Youtube. Note, there are no subtitles and are uploaded raw as is. People are free to make an English translation as they wish. What's up with the scanlines at 3:00? This is pretty exciting! Can't wait to learn more about the launch date. Would love to grab one of these. 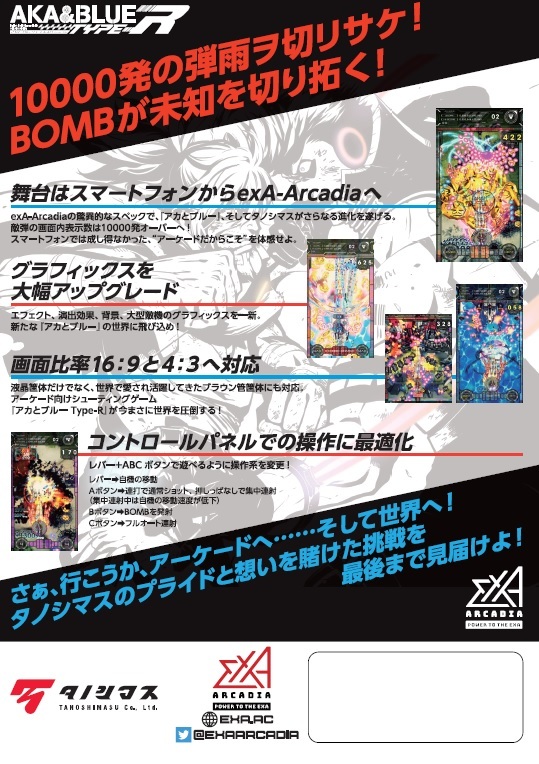 I really do wish Exa Arcadia would update their website to reflect the latest changes and be more ready for the near Summer 2019 release. 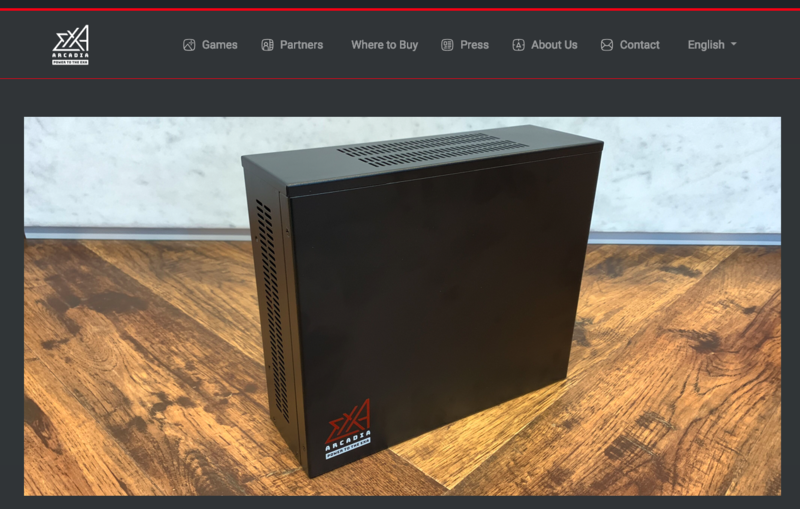 I am no way an associate for EXA Arcadia, and this post is meant for fun and fans of the upcoming hardware platform and revival of arcade games. Last edited by MrJBRPG on Thu Feb 21, 2019 1:25 pm, edited 1 time in total. 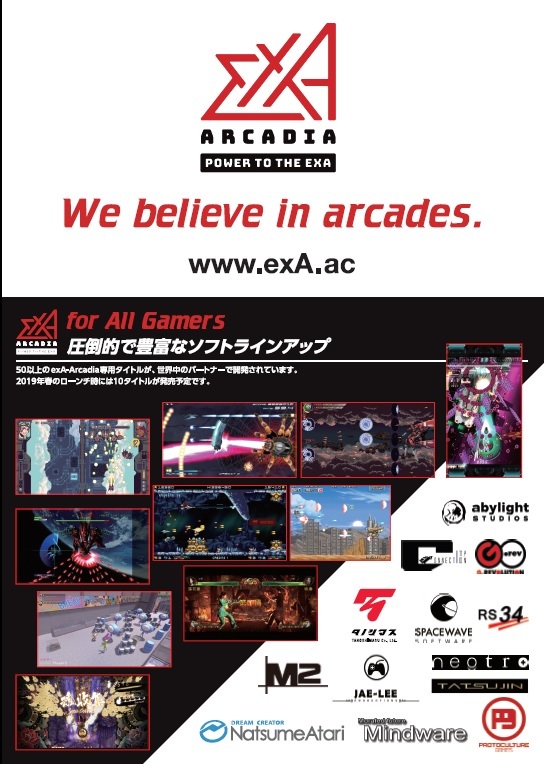 Exa Arcadia Website is now updated! Now it is revised to be sleek, cleaner, and more uniting in brand colors like I have critiqued when it first came up. Before the change, the game and partner sections seemed to have a noisy array of rainbow in the panels, with some being harder to read against white text. There is also an updates blog section containing relevant news! I am very pleased that that Exa's website has been updated to a more professional level. Browsing the games and partners is also easier with picture of title with more information after clicking on the title. Have a look at a now updated website with launch titles coming this year in 2019!